Since 1987 when Eurasian Water Milfoil was first discovered in the waters of Lake Minnetonka, it has spread increasingly now with over 750 lakes in Minnesota designated as infested waters. 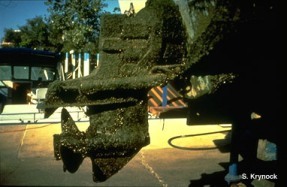 The spread of invasives is occurring by all accounts due to the transportation of aquatics on boat trailers between bodies of water. This is why there now exist laws in Minnesota and Wisconsin prohibiting the transport of any attached vegetation to boats or trailers on public roads. Through education, many boaters have become aware of the impact they could have on a lakes ecology through the transportation of invasive species such as Eurasian Milfoil. However there still exist large numbers of boaters who are either indifferent or belligerent about cleaning their boats and trailers prior to launch or after pullout. 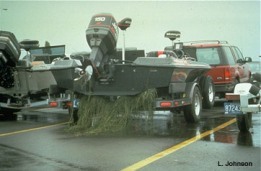 In one study conducted by the DNR on Lake Minnetonka, 12.7% of boaters leaving (1091 out of 8535) and .7% of boaters entering were carrying attached vegetation on their trailers. In one analysis of this data, 50,000 boaters used public accesses on Lake Minnetonka and up to 532 boats may have come from Zebra Mussel infested waters bypassing inspection hours. Upon close inspection, volunteers often uncovered hidden plants on the boat trailers and other recreational equipment. Information collected at the boat landing indicated 6% of all inspected boats had vegetation attached when approaching the landing, while 23% had vegetation attached as the boat pulled away from the landing. Twenty-three percent of all Wisconsin registered boats equates to over 143,000* boats pulling away from the landings carrying aquatic plants that could potentially infect another water body with Eurasian water-milfoil, zebra mussels or other aquatic invasive species. 1) Inspect your boat, trailer, and boating equipment and remove any plants and animals that are visible before leaving any waterbody. 2) Drain water from the motor, livewell, bilge, and transom wells while on land before leaving any waterbody. 3) Empty your bait bucket on land before leaving the waterbody. Never release live bait into a waterbody, or release aquatic animals from one waterbody into another. 4) Wash/dry your boat, tackle, downriggers, trailer and other boating equipment to kill harmful species that were not visible at the boat launch. Either rinse your boat and equipment with hot tap water, spray your boat and trailer with high-pressure cold water or dry your boat and equipment for at least 5 days before transporting it to another waterbody.